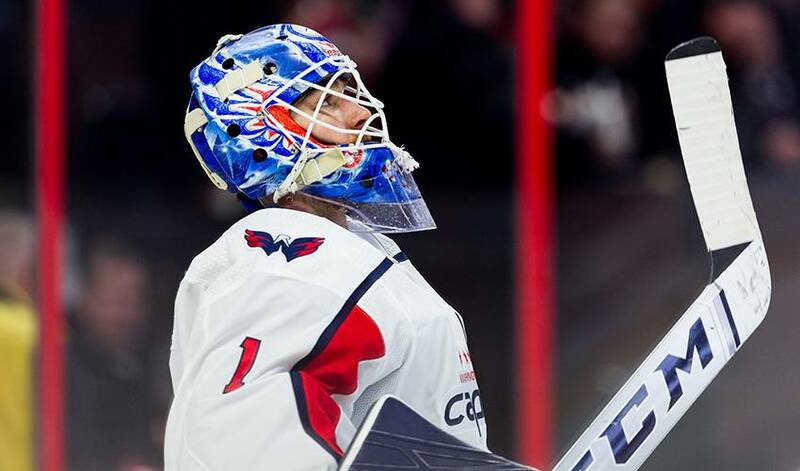 ARLINGTON, Va. — The Washington Capitals will soon have some decisions to make about their future at goaltender. The Capitals signed backup Phoenix Copley to a $3.3 million, three-year extension Monday that keeps him under contract through the 2021-22 season at a salary-cap hit of $1.1 million. It's a move that gives the defending Stanley Cup champions some stability in goal but raises questions about their plans. Starter Braden Holtby is only signed through the end of next season, and Washington has top prospect Ilya Samsonov and 2014 second-round pick Vitek Vanecek in the system. With Copley in the fold, the decision is looming between committing long term to Holtby and turning the net over to Samsonov. "It'll work itself out, I think," general manager Brian MacLellan said. "We'll see how Samsonov comes and what our situation is cap-wise and the signings we determine to make." Holtby won the Vezina Trophy as the NHL's top goaltender in 2016 and rebounded from a rough stretch last season to backstop Washington to the first title in franchise history. But he stands to get a significant raise from $6.1 million per year and will be 31 when his next contract begins. Given that the Capitals have already committed big dollars and term to centre Evgeny Kuznetsov, wingers Tom Wilson and T.J. Oshie and defencemen John Carlson and Dmitry Orlov and also have centre Nicklas Backstrom's contract up after next season, there is no guarantee the room is there for Holtby. "It's human nature to think about it," Holtby said. "But outside of maybes, you have no idea. It's a long ways away. A goaltender's life can change pretty quickly, so you've got to stay in the moment and just play." Samsonov was the 22nd pick in 2015 and considered one of the best goalie prospects in hockey. He got off to a rough start in his first season in North America with Hershey of the American Hockey League but the 21-year-old Russian has played much better since. With Vanecek also in the mix, it could pave the way for a trade before the Feb. 25 deadline. "I like Vitek, too. Samsonov is coming," MacLellan said. "Holtby is Holtby. He's an All-Star goalie. And Copley is finding his way as a good No. 2, so I think it's important for us to have depth as an organization, protect yourself on injuries." Copley has exceeded expectations in his first season as a full-time NHL backup, going 10-5-3 with a 2.98 goals-against average and .903 save percentage. The 27-year-old from North Pole, Alaska, came into the year with a 4.32 GAA and .829 save percentage in two games with the St. Louis Blues. The Capitals turned to Copley almost by default after trading Philipp Grubauer to Colorado. Coach Todd Reirden said Copley has earned extra starts. "There are four different occasions that I can tell you about that we could've used Braden in that situation and we chose to use Pheonix and he produced right after it," Reirden said. "That's how you earn the coach's trust and the players' trust and the player battle for him hard because they know the effort he puts in every day in practice." Teammates saluted Copley before practice when Reirden told them about the extension, which came after he made adjustments with goaltending coach Scott Murray since training camp. "A lot of it's adjusting to the speed, and the little changes from league to league," Copley said. "My plan is just to continue to get better every day, continue working with Scottie and just make sure my game is growing continually."